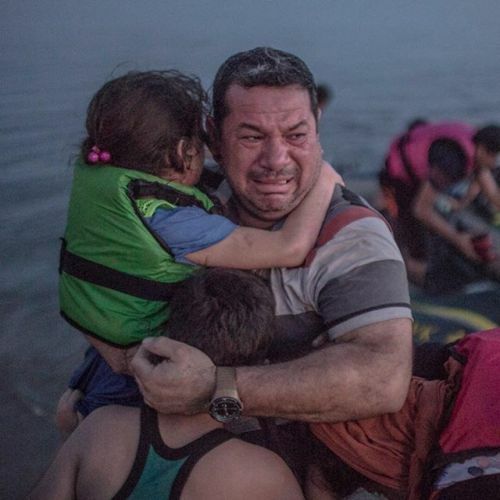 “Laith Majid, a Syrian #refugee from Deir Ezzor, breaks out in tears of joy, holding his son and daughter, after they arrived safely on the Greek island of #Kos. The group crossed over from the Turkish resort town of #Bodrum. On the way, their flimsy rubber boat, crammed with about 15 men, women and children, lost air. But compared with other routes for refugees crossing the Mediterranean, the journey from Bodrum to Kos is remarkably organized and unfettered. At least 2,000 refugees — most fleeing wars in Afghanistan, Iraq and Syria — crossed this past week alone. The Greek government has said the sheer magnitude of the wave of migrants and refugees is too much for such a crisis-ridden country, or an island like Kos, to handle. @danieletter photographed Laith and his children while on #nytassignment.” By nytimes on Instagram.